Have you ever had a conversation with a person, walked away, said “Well, that went well,” only to discover that the other person had a very different interpretation of the discussion? And then, the inevitable realization sinks in. It becomes painfully obvious that the two of you were on totally different wavelengths. What is a wave length anyhow? Well, one definition of a wave of any kind, is that it is energy moving through a medium or space. If you think about a wave in water, it is the force of energy moving the water that is what we see as a wave. The length of those waves, are the measurement— in the most simplistic definition— between the peaks from one repeating pattern to the next. So put it together, you have a measurable pattern of energy moving through a substance. We humans are forces of nature too. Substances made of energy and cells and water, formed from complicated patterns in a miracle so complex that I stand in awe of it. I am no scientist. I offer no proof, but it is easy for my imaginative brain to put together the concept that we are walking, talking wavelengths of our own energetic force field, wittingly and unwittingly transmitting and communicating to those other walking wavelengths every moment of the day. I am not the only believer. There are many coaches, body workers, inspirational speakers and mentors that speak about the energy fields working through and around us. So what does that have to do with communication? What all of these have in common is that the energy radiating from the physical wavelength was speaking up louder than the words being spoken. The person listening was listening to the energy and wavelength and not the spoken words. Sometimes, your mouth and your energy are in alignment. All is well. You feel put together, authentic and ready to take on the world. You begin a conversation with someone and you hit the wall. Words are dropping to the ground like dead flies. It is obvious there is no connection. Stop and see if you can tune in to their energy instead of their words. Are they really upbeat? Or is it more forced than you first noticed. . Perhaps slowing down and offering a little more reassurance would be key. Is there something else radiating behind that agreeable friendly tone that would explain the non-committal lack of interest? Maybe there is anger, maybe there is a wall of fear blocking their ability to comprehend. Tune in, see if you can feel that wall, those bricks that have built up from lack of trust and bad past experiences. A few key questions about what their main concerns might be could break down that block. What Happens When the Conversation is Virtual? There is no doubt that energy is much harder to read when distance becomes involved. This is what makes on-line, on-phone and written communication so much more complex than communication in person. That complicates virtual companies and their client relationships, not to mention social media conversations. There will undoubtedly from time to time be misunderstandings that take place because the physical proximity of energy is a natural way that we communicate- whether we are aware of it or not. When we lose that close up-wavelength connection, we lose an instinctive communication tool. It takes extra focus, extra energy, and extra listening and care to make sure your communication is connecting. I should know. Deb and I work together online together every day. In fact— for the first six months of being together, we had never met each other in person. I had no idea what she looked like— except that she was tall. We wrote an entire novel together, before we ever laid eyes on each other. 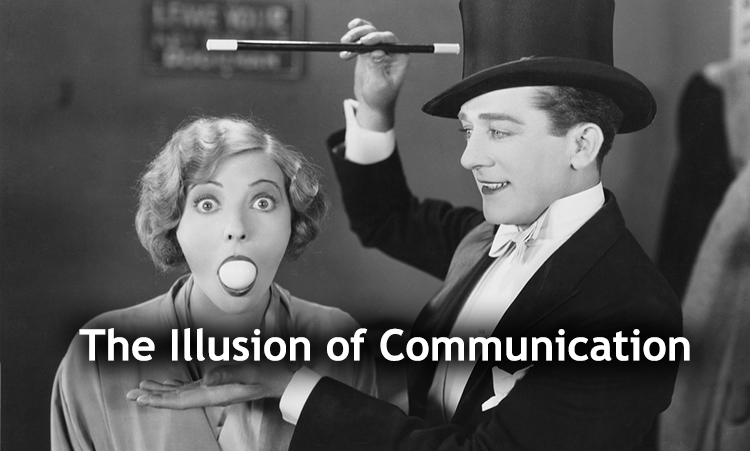 Even now, the majority of the work we do, is communicated through a trail of IM conversation. We follow some very specific rules. When in doubt-ask. Then ask some more. Avoid knee-jerk reactions, think it through. Don’t make assumptions, clarify, clarify, clarify. Keep the big goal in mind, don’t get hung up in the muck of minutia. Find a common ground of respect and agreement to start the conversation. The truth is, our rules for successful on-line communication are good rules for any partnership. They are critical for one that has limited communication options. And as time has gone by, we have gotten pretty good at reading each other’s energy and wavelengths over an IM chain of conversation too. Even from two different sides of the country. « Is Your Book A Priority? Such an important topic, Wendi! Communication doesn’t happen if it isn’t meaning isn’t exchanged. My husband has a phrase to add to your list: “Just because you handed it over, doesn’t mean it is in my hand.” When we miscommunicate, we say to each other….”oops, it fell on the floor.” Helps break the frustration that sometimes accompanies the “mess on the floor.” Great tips and tools! It’s pretty amazing how something little can get out of hand with virtual communication! We have experienced it with a client who never asked a single question, never responded to our offers of help, never utilized any of our experience in the consulting included in her package … but instead just stewed and suffered on her own because of one thing in an email she misunderstood at the very beginning of the project. It’s frustrating because one quick phone call would have cleared up the entire thing and she would have enjoyed the process so much more, and she would have received a better final product. I find it much better to jump on the phone, Skype, or even do a quick Google Hangout, instead of always hiding behind email. Not only is it more personal, but it allows people to communicate fully and not just with words.